Delicious and juicy orange juice contain an impressive list of essential nutrients, vitamins, minerals for healthy growth and development and overall well-being. Orange is a tropical to semitropical, evergreen, small flowering tree, growing to about 5 to 8 m tall, and bears seasonal fruits that measure about 3 inches in diameter and weigh about 100-150 g.
Oranges classified into two general categories, sweet and bitter, with the former being the type most commonly consumed type. Traditional sweet varieties include Valencia, Navel, Persian variety, and blood orange. Tangerines are related varieties of oranges distinguished by loose, easily peeled skin (pericarp) and sweet juicy flesh (arils). They are also known as mandarin oranges in Europe and Satsumas in Japan. Just as oranges, they too belong to the Rutaceae (Citrus Family) and known scientifically as Citrus reticulata. One 8-ounce glass of orange juice gives you at least 100% of the recommended Daily Value for vitamin C.
Vitamin C is an important antioxidant, as it may help neutralize “free radicals” formed as part of the body’s natural oxidation processes. Some influences of modern life, like smoking and air pollution, may also be responsible for the formation of free radicals. 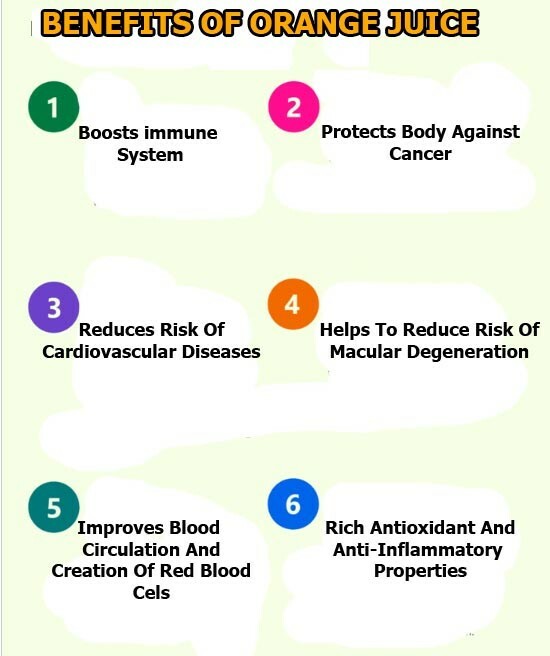 Many scientists believe that free radicals may cause cell damage that contributes to the development or progression of chronic diseases like heart disease and cancer. One 8-ounce serving of orange juice is fat-free and, at 110 calories per 8-ounce glass, has fewer calories than many commonly consumed 100% fruit juices. Vitamin C found in orange juice is essential for the production of collagen, which is needed for healthy skin and gums. Collagen breakdown in the skin may lead to signs of premature aging. Regular consumption of Florida orange juice can provide you with the vitamin C you need to help support collagen formation. Oranges contain citric acid, a key component of the alpha hydroxyl acid group that can reduce wrinkles and soften your skin. It is often used in chemical peel products to remove dead cells and make your skin look younger. Vitamin C, on the other hand, boosts the production of collagen, thus keeping your skin firm and moist. When applied topically, it hydrates your skin, thus reducing wrinkles to provide a youthful appearance. When you get a cold, it’s important to give your body the fluids and nutrients it needs. An 8- ounce glass of orange juice provides at least 100% of the recommended Daily Value for vitamin C, plus other nutrients and phytochemicals that can help support a healthy immune system. Citrus foods like orange juice are high in vitamin C, which may help boost the absorption of nonheme iron (the iron found in plants like spinach, not meat products). This is great news for young women, female athletes and vegetarians who may be more susceptible to iron deficiencies. A prominent cancer researcher, Dr. Gladys Block, Ph.D., reports that people with low vitamin C intake (less than 50 mg/day) appeared to have approximately twice the cancer risk, compared to people with higher (greater than 100 mg/day) vitamin C intake. Nutrients in oranges are plentiful and diverse. The fruit is low in calories, contains no saturated fats or cholesterol, but rich in dietary fiber, pectin. Pectin, by its virtue as a bulk laxative, helps protect the mucosa of the colon by decreasing its exposure time to toxic substances as well as by binding to cancer-causing chemicals in the colon. By binding to bile acids in the colon, pectin has also been shown to reduce blood cholesterol levels by decreasing its re-absorption in the colon. Orange Juice is rich in vitamin A as well as various flavonoid contents along with antioxidant particles like alpha and beta carotenes, beta cryptoxanthin, zea-xanthi, and lutein that help in maintaining a healthy mucus membrane and skin of the eye as well as prevent macular degeneration. Oranges are rich in potassium, an electrolyte mineral that controls the heart function. Low levels of potassium can lead to abnormal heart rhythm known as arrhythmia. Apart from this, drinking orange juice can reduce the levels of ‘bad’ LDL cholesterol which collects in your arteries and blood vessels, causing heart problems, cardiovascular issues, and interrupting the flow of healthy blood and blood oxygen flow. Diabetics are unable to absorb glucose because the beta cells in their pancreas either fail to produce insulin or are unable to respond to the production of insulin. The high content of fiber and high glycemic index of oranges make them beneficial for diabetic patients. Orange peels have a lower percentage of sugar that can bring down their blood sugar levels. Oranges are fat and calorie free and contain a large amount of dietary fiber called pectin. Besides, it contains vital nutrients like thiamine, niacin, vitamin B6, magnesium and copper. All these contents contribute to weight loss as well as boost the body with vital nutrients and vitamins. The vitamin C of oranges triggers the production of collagen, thereby preventing the separation of tissues of your hair. The better circulation to the scalp ensures better hair growth. Folic acid and inositol present in this orange hued fruit prevents hair loss, thus ensuring better hair. The folate or folic acid present in these juicy fruits promotes brain development and keeps the vital organs of the baby healthy. 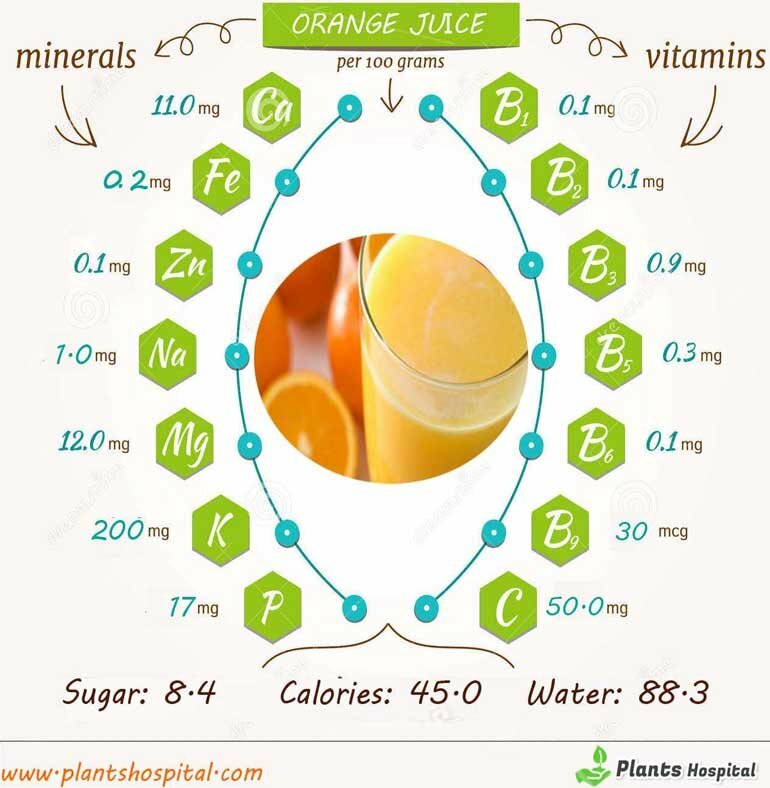 Drinking 1/3 cup of orange juice each day provides about 40 mcg of folates to expectant mothers, which is equivalent to 10% of the recommended daily value. Orange juice is the most important variety of fruit juice worldwide. Globally, consumers each drank an average of 7.8 litre. The production and sale of food and drinks generates billions worldwide, and it is large corporations which are responsible for labour and production conditions in the industry. However, when it comes to assuming responsibility, these corporations stress that they are under no legal obligation. How to Prepare Homemade Orange Juice? 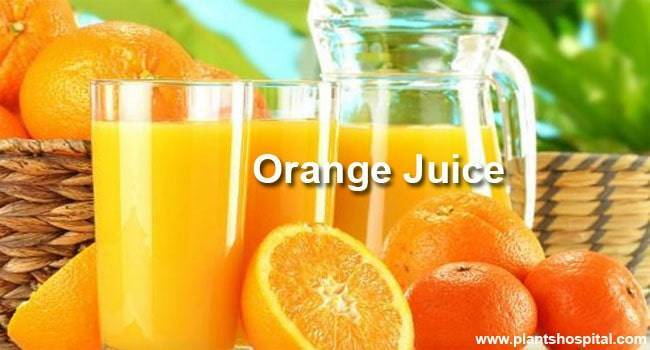 Orange juice can be a refreshing and nutritious substitute to various processed beverages. Besides being soothing to the taste buds, it is an amazing source of vitamin C and other nutrients. Along with being a nutritious drink, orange juice can be used externally for better hair and skin. Chuck out all those commercial orange juices and prepare this delicious drink at home. Tightly squeeze or roll the oranges firmly with the palm of your hand across the counter to soften them. Then, slice the oranges and discard the seeds. Gripping one of the orange halves tightly, you can squeeze it by hand using a plain juicer to extract the entire juice. If you want, you can scrape the orange halves with a spoon and add the pulp directly to the juice. In short, oranges don’t have many known adverse effects in healthy people. Some people have an allergy to oranges, but this is rare. In people who suffer from heartburn, consumption of oranges may make symptoms worse. This is because oranges contain organic acids, mainly citric acid and ascorbic acid (vitamin C).